​As we all know Bushnell rangefinders have its reputation in the golf equipment market. But, as a buyer, we must know in's and out of the product before getting hands-on. In this article, we will try to help you compare this product and go in depth to see if it is a right fit for you or not. Bushnell Tour V3 Jolt Golf Rangefinder is first launched in the year 2013. It has an LCD display with 5x magnification and has many premium features like JOLT, laser and Pinseeker technology. It has almost received a five-star review on Amazon from 790 customers. So, let's dive in into the blog post to help you get more info about the product's battery life, manual guide and many more crucial questions to help you choose. Without wasting any time, let jump right in into the meat of the article. ​​As you have already known by now that it is an old product of Bushnell company released in the year 2013. 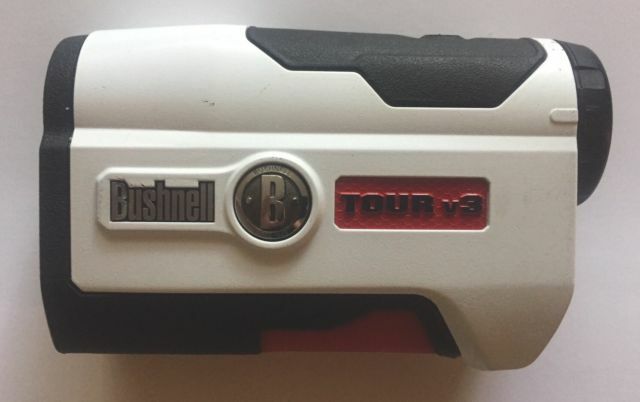 But, it does not mean that you cannot get the benefits offered by the Bushnell Tour V3​. In fact, you may get more out of this product than the newest rangefinder on the market. ​The product comes with Pinseeker and JOLT technology with 5x magnification but no slope feature available. You can get the slope feature in Bushnell Tour V4, the latest version of Bushnell Tour Golf Rangefinder series. Besides that, if you want a solid laser golf rangefinder with a trust badge behind it and hundreds of satisfied customers than you cannot go wrong choosing the V3 model. The price also comes down drastically when you choose this model over V4. When it comes to the range of the product than the reflectivity from the target plays a major part. When the reflection of the object is very high the machine can read maximum 1000 yards of range. Please note: The environmental conditions also play a crucial role while determining the range. ​With Pinseeker technology, a player can get the distance to the flag with a push of a button. It is an advanced mode which allows a user to get an accurate distance to flag without accidentally measuring the background targets which usually have stronger signal strength. It is all done by a laser beam able to recognise more than one object and providing the user only the distance of the flag. Another main feature of this product is that it comes with JOLT technology. It simply means that a user will feel a vibration whenever the flag is detected by the Pinseeker technology and the distance to it will be displayed on the LCD of the device. ​Battery life of this product will not be exceptional as it only allows CR-2 3 volt lithium battery. For an average player who plays two to three times a week can expect to get 2 months of lasting. You will also get an indicator specifically designed to signal low battery. The indicator will pop into your in-view readout and will let you know about it. Is Slope Function Available in V3? ​As we have already mentioned, the slope technology is not available in the standard edition of Tour V3. If you definitely want this feature then we will suggest you grab Bushnell Tour V4. If you are an experienced player you may already know that there is a caveat regarding this technology. For those who do not know, we want to tell you that slope technology is completely banned in competitions and it goes against the rules set by USGA. So, you have to ensure before buying any golf rangefinder that there is an option to disable the slope feature. Otherwise, you cannot play with that rangefinder in any tournaments. With Bushnell Tour V4 you are getting the option to turn OFF slope feature by a push of a button to make it tournament legal. Will It Be Damage By Water? ​Official documents say it is water resistant but we still recommend you to keep it safe from rain or any water splash. We have found some complaints about the product not working temporarily when it gets wet from the rain. So, we want to make sure you know about it before buying. By the way, Bushnell provides a good quality carrying case to save it from any damage. This case also has a carabiner to hook to your bag. ​Besides all the features mentioned above, it has a threaded tripod mount at the bottom through which you can attach accessories like golf cart mount and push/pull cart monopod. Lastly, buyers have a doubt if Bushnell Tour V3 can read in both yards and meters. The answer is YES. The device can read and present data to a user in both measuring units. By default, it will provide distance in yards but if you want to change it to meters then you need to turn OFF the device completely and press the power button down to turn it on and hold it for 5 seconds. The V3 will start cycling through Yards / Metres and gives you an option to choose between the units. ​As we have already told, it is an old product of Bushnell company. But still, it can compete with many latest golf rangefinders. You are getting a product from a very trusted brand with thousands of satisfied customers. Yes, we still have to admit that it misses certain features such as absent of slope technology, GPS and fast focus system which are offered by latest rangefinders of Bushnell. Other than that, we do not see why it could not benefit any golf player who wants a rangefinder in their game for better accuracy and all-around performance. ​According to us, after all the research and comparisons we can say that you can definitely buy this device and enjoy between 80-90% of the premium features that most top end golf rangefinder has to offer. If you want some extra features like Slope and GPS then you cannot go wrong with Bushnell Tour V4. ​What is the warranty period for this product? ​It provides 2 year limited warranty where you have to pay for the shipping cost. What are the accessories included in the box? ​The brand new box comes with the device, batteries and a carrying case. ​What is the ​​size dimension of the product? ​Measuring 4.3 x 2.8 x 1.6 inches. ​What is the ​weight the product? The weight of V3 is 187 grams or 6.6 oz.